Mixed climbing is the art of moving over the frozen mediums of Ice and Rock. ‘Classic’ mixed climbing originated in the mountain environments and is a skill needed on many alpine faces. ‘Modern’ mixed, a fairly new style of climbing, was developed as a way to climb all the “not quite formed” ice routes. Modern mixed takes classic mixed terrain, steepens the angle, transfers it to a cragging area, and is often protected by bolts. 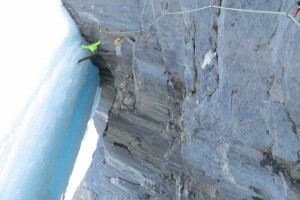 In some aspects, it is the “sport climbing” version of winter climbing. A modern mixed route will have as much rock as ice, the rock is climbed by “drytooling”- hooking your ice axes and crampons on rock ledges and cracks. Winter climbers now seek out mixed routes for the visceral positions, increased challenge, and endless variety that they offer. Mixed climbing has been changing the world of winter climbing. Often their will be as many climbers on mixed routes as ice routes at the local winter crags. Mixed climbing skills learned at the crags can also be used in alpine environments on classic mixed terrain. In fact, mixed skills will help improve your Ice climbing abilities. Mixed experience is a needed asset to the all round climber as well as the winter specialist. Most importantly it is a whole lot of fun…. Come see why. Our two day clinics offer lowest ratio(2:1), customized, climbing instruction. 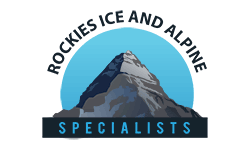 Clinics are based at the famous “mixed crags” throughout the Canadian Rockies. Close to the towns of Banff and Canmore these venues allow for strong coffee starts, “cold stone cranking” during the day and dark beer with fine cooked meals at night….classic Canadian Rockies climbing culture. With the small group size we are able to customize the clinics to your needs, desires, and dreams! Ideal for those looking to try out his exciting new sport and expand their climbing skills. With some basic mixed climbing instruction you will greatly increase what is possible at the crag or in the mountains. This course will take you through the basics of ‘classic mixed’ and into the world of ‘modern mixed’ climbing. You will scrape, smear, swing, dangle, dry tool….all with the grace of a ballet dancer! If you’ve already been introduced to mixed climbing and want to bump up your skills and performance then this is the course for you. After ensuring you have a solid foundation, we will explore the specialty techniques of modern mixed climber. A perfect follow up to the Intro course.